We're thinking here of an idealized solid, in which the distance between any two internal points stays the same as the body moves around. That is, we ignore vibrations, or strains in the material resulting from inside or outside stresses. In fact, this is almost always an excellent approximation for ordinary solids subject to typical stresses -- obvious exceptions being rubber, flesh, etc. Following Landau, we'll usually begin by representing the body as a collection of particles of different masses held in their places by massless bonds. This approach has the merit that the dynamics can be expressed cleanly in terms of sums over the particles, but for an ordinary solid we'll finally take a continuum limit, replacing the finite sums over the constituent particles by integrals over a continuous mass distribution. 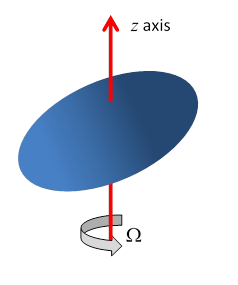 has two parameters, and For some systems, the parameters can be changed externally (an example being the length of a pendulum if at the top end the string goes over a pulley). We are interested here in the system's response to some externally imposed periodic variation of its parameters, and in particular we'll be looking at resonant response, meaning large response to a small imposed variation.